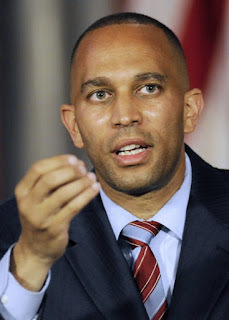 Last night in Washington, Representative Hakeem Jeffries (D-New York 8th Congressional District, Brooklyn, Queens) took to the House floor demanding that President Trump release his tax returns. Jeffries, a member of the House Judiciary and House Budget Committees, presented a privileged resolution which would delay any tax-reform legislation until the House Ways and Means Committee has had the opportunity to review Trump’s tax returns and determine how and if the president could benefit from tax-code changes. The “privileged” resolution means that the House would have to act within two legislative days. -Immediately request tax return information of Donald J. Trump for tax years 2007 through 2016 for review in closed executive session by the Committee on Ways and Means, as provided under Section 6103 of the Internal Revenue Code, and vote to report the information therein to the full House of Representatives. -Postpone consideration of comprehensive tax reform legislation until after the elected representatives of the American people in this House have been able to review Trump’s tax returns and ascertain how any changes to the Tax Code might financially benefit the President of the United States. Jeffries stated that the American people deserve transparency concerning the President’s financial conflicts of interest and possible involvement with Russia.